Two organisations, Performing Right Society, PRS, and Phonographic Performance Limited, PPL, collect royalties for performers when music is played in public. Licence fees are payable by restaurants, sports clubs and discos, where copyright music creates an ambience to help the business attract the public and make money. By contrast, attendance in an office or workplace is mandatory. What is happening in such places is replacement listening whilst staff are not in their own cars or homes. - Ten individuals in an office could listen to ten radios. Practicality and energy efficiency simply make sharing sensible. - Spillover from a radio in a car workshop to a waiting area is not relevant, only a radio specifically intended for that public area. - A radio playing behind the counter for staff in a shop is quite different from an installation where loudspeakers are deliberately placed in the public area. Early last week one of my teeth started to get a little sensitive. As the days went on the pain started to get worse. The thought of eating my tea now gave me two things to fear, one being Carols cooking and the other was a sharp stabbing pain (not that I would know what that's like cos I've never been stabbed)that went from my tooth right down to my slippers. It was getting to a stage were my use of paracetamol was noticable enough for Carol to get on my case, but not before getting onto a vast number of medical websites on the Turley Towers computer system. The result of this Internet fishing was me being warned about the severe risk of death through a possibly neglected abscess. Apparently this is what all the Mummies died of in the olden days. So with Carols hand firmly pushing me out the door it was of to my lady dentist who has had three goes so far trying to fit a £200 inlay onto the tooth that is now the epicenter of my now life threatening (suspected) abscess, as apposed to a common filling. I am on my second day of antibiotics, I have my X-ray on a CD to take back to the dentist. But i don't want to go. Cant the tooth fairy come an whip it out overnight and leave me some money. I think I would like that. After reading an article by "The Money Saving Expert" I have found myself doing lots of shopping via a website called Quidco. Now you know me, always suspicious and very careful. The first thing i did was to get an insurance quote for my car, not only was it far cheaper than any I had already obtained but it paid £75 as cash back. The site charges £5 per year But only if you earn more than £5 so you cant lose. So I bagged £70 on my first shop and now use it for ebay and and any online shopping. This Tuesday is the 1st of June 2010 (this year is flying by) And will be day One of the new evening show on Dune 107.9 and Central Radio 106.5. Chorley has many fond memories for me too as I did present Love Songs on Chorley FM on one of its trial broadcasts (RSL's) I hope its not me that Peter kay was refaring to when he says "ChorleyFM Coming in your ears". I am really looking forward to the new show. I will have a host of new features and will be totally Live and Interactive. Over the Easter break I decided to take in a little bit of fresh air and (as it turned out) a little bit too much sun. The event I attended was a Horse Show on a farm near St.Helens, One that was to feature my very talented Daughter Rachel and her (once little) pet horse Ellie. It was a little odd because it was where Rachel had her very first riding lesson as a child. Ellie, (I found out on Sunday) was bred from a mixture of Racehorse and Show Jumper and she too seemed to be very talented, and it wouldn't have suprised me if it turned out she could perform a few card tricks as well as everything she had to do in the competition . It was a very hot day, but with a bit of a breeze blowing didn't feel uncomfortable, Until I got home and my face started to turn bright red in color and my skin began to tighten a little, and feel like I had washed in Petrol. So with a talented pair like Rachel and Ellie a couple of wins seemed certain. So well done to them both for wins in "Riding Club Horse" and "Senior Equitation" 2nd in both but first time out this year. I think Ellie would have done a little better had I not been feeding her polo mints and playing with her. Friday night was of course The 31st October "Halloween", and I had the pleasure of being invited to New Pleasureland in Southport for their Spooktacular Bonfire and Firework Event. New Pleasurelands owner Norman Wallis has done an amazing job trying to keep a fairground in Southport and securing it as a true family holiday destination. Representing Dune 107.9 along with Breakfast Co-Presenter Karen Johnson, our task for the evening was to judge the fantastic fancy dress costumes being worn by children attending the Spooktacular event. The atmosphere on the night was great. Well done to everyone who made a great effort on the night. I loved every minute. Good luck for the future Norman, Here's to the true revival of Plesureland "Southport"
Many people know the name Rhys Jones. Rhys was an innocent 11 year old boy who was shot and killed on his way home from football practice in 2007. Joining me on my show today were the talent behind a brand new Charity Single Angel Child (as pictured above)Jules Burgess-Kennedy and Mike Bradley. Mike's son played football in the same team as Rhys and had watched him play all that season. ANGEL CHILD is fully supported by Rhys Jones parents Steven and Melanie. All proceeds from the single sales will go to charity which is aiming to build a Community centre in Rhys name. Plus provide funding for various other sporting events and projects nationwide that will benifit children all over the UK. The Centre will be built close to where Rhys lived and hopes to encourage children to get involved in sport rather than gang culture. "Join a Team not a Gang"
Its a great song by a really nice group of people who its been an honour to meet. That makes it two weeks in a row I have made our local paper. Finding the picture is easy, just turn to page 41 of Friday’s edition of The Southport Visiter. Last year The Mere Brow Giant Pumpkin Competition was forced to change to a larger venue as the popularity grows. Me and Carol are pictured with (organizer) Trevor Wilson, Gerrard (last years winner) Margaret (from the shop) and Jackie from the Northwest Air Ambulance doing the official cheque handing over ceremony. The total money raised was £1311.50. This year’s competition will be held at 2pm Saturday 18th October at the farm, and we would love you to be there. Have you ever opened a newspaper to see your own face smiling back at you? Well that is exactly what happened to me this week. Sat back having a minute at work thumbing through this week’s edition of The Southport Visiter. To my surprise it was a picture of me. And I was sharing page 40 with 1986 legends Simon Groom, Peter Duncan and Janet (mum of Sophie Ellis Bexter) Ellis "the team from Blue Peter" and Southport Icon and best mate of Sooty "Connie Creighton". 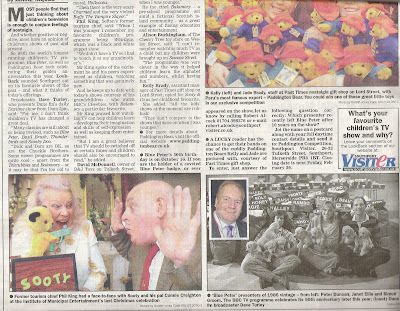 Click on the Southport Visiter title, to go direct to the article which can be found in the LookBack section. The section is created by Robert Alcock who is looking for your favorite children’s TV show, holders of the coveted Blue Peter Badge and local people who have been on the show. Robert can be contacted on 01704 398276 or e-mail robert alcock@southportvisiter.co.uk. Five foot nine and three quarters tall. A Dad to a Son (Peter) and Daughter (Rachel). Who likes time in the garden and doing a bit of Diy. I enjoy making and Playing music.